Hello, are you being helped? What’s that? Yes, its six days to Christmas. Time flies, doesn’t it? Sure, we do special orders. You want an original print of the Gutenberg Bible from the 1450’s? And you want it… today? Let’s see if I can call that up in our inventory. [Pretending to type on bookstore computer while keeping screen away from customer’s prying eyes.] Excuse me? No, no I don’t think anyone’s written a comprehensive biography of John Tesh yet. I know, right? Someone’s asleep at the publishing wheel. Might I suggest these 10 books for any musically obsessed friend or family member? Less an autobiography than a 21st-century version of Greil Marcus’ Lipstick Traces, Byrne eschews the rote tell-all about his life with Talking Heads (although the book’s title could be a lost Heads record circa ‘79) and as a solo journeyman. Instead, he reveals the encyclopedic variety of his musical influences and intellectual pursuits—from prehistoric bone flutes and MIDI software to pie charts of his album sales and handy tips on creating your own music club. Keeping with Byrne’s (and publisher McSweeney’s) cleverer-than-thou format, HMW is paginated backwards. We love anything from historian Ted Goia (West Coast Jazz, Delta Blues). His latest, a compendium of 250 jazz classics like “Tear For Two,” “My Funny Valentine” and “St. James Infirmary”—who wrote them, how they were written, who did the definitive versions of them—was well worth the wait. In many ways, Goia’s book is the grandchild of the underground “fake books” of compiled sheet music that jazz musicians used to carry around with them. Reading this book is like finally hearing Dylan’s “Basement Tapes,” a public secret being shared with the outside world. Watch as two award-winning contemporary American white-guy-with-glasses neo-realist writers who have always weaved rock music into their fiction finally just go for it. Like their late compatriot David Foster Wallace, they attack their chosen topics from every angle: personal, cultural, political, and a few ways we haven’t yet found words to describe. A book that covers the epic journey of the piano has no right to be this slim and brisk. In only 385 pages, pianist/teacher Isacoff profiles the most orchestral of instruments by following all of the hands who took new styles on its 88 keys, from its 18th-century Florencian inventor Bartolomeo Cristofori through Mozart, Horowitz, Cliburn, Rachmaninoff, Rubenstein, van Cliburn and Oscar Peterson (the author’s obvious fave). It’s like a nonfiction version of E. Annie Proulx’s Accordion Crimes but less depressing. When a customer asks for an “inspirational biography,” it usually means something in the Religion or Metaphysics section. Consider diverting them to the Music section for art critic Kay Lawson’s handsome volume on the iconic avant-garde composer John Cage. This year, many books (new and reprinted) have accompanied the 100th anniversary of Cage’s birth, but none have Lawson’s unusual—and liberating—perspective: how the composer’s musical outlook shifted when he discovered Zen Buddhism. How does a song evolve from the mind of its creator to something larger in the popular imagination? And how do four simple notes—da-da-da-DUM—inspire everyone from Ralph Waldo Emerson and Mao Zedong to the Nazis and the Allies in WWII? 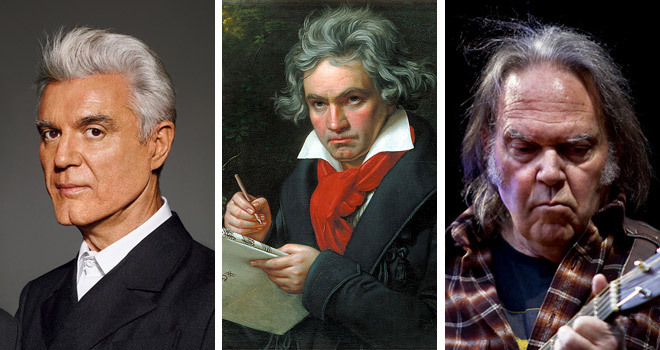 Guerrieri uncovers everything you’d ever want to know about Beethoven’s most famous symphony, from its composition in 1808 to its disastrous premiere through its more recent incarnation as a rallying cry for both discotheques and cellphone ringtones.